This is volume two of a series on Half Tracks of the IDF. This volume includes hundreds of color and black & white photos – many of which have never been published. 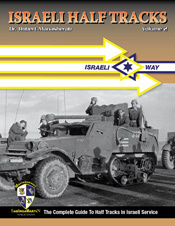 Israeli Half Track – Volume 1 includes several 1/35 scale line drawings and color profiles. Use the email address below to place an order. Shipping with in the USA is $7.00 via Priority Mail. International shipping will be supplied for each order . TO EMAIL: sabingamartin@yahoo.com. We will respond quickly with payment information.